The Republic of Texas existed from March 2, 1836 until February 19, 1846 and during most of that time it boasted its own navy with a history as colorful as its government. As Texas settlers, unhappy with the Mexican government, prepared to go to war for independence from Mexico, officials of the interim government realized ships would be needed to keep Mexico from blockading the Texas coast and to keep supplies coming from New Orleans to support the army. Historians estimate that three-fourths of the troops, supplies, and money needed for the rebellion came via shipboard from the port at New Orleans. 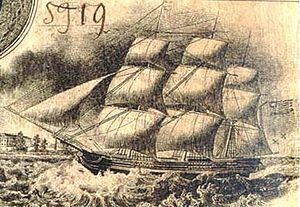 The provisional government in November 1835 passed a bill providing for the purchase of four schooners and they issued letters of marque to privateers authorizing them to defend the Texas coast until the navy ships could be put into service. On January 5, 1836, the Texas Navy became a reality with the purchase of a former privateer rechristened the Liberty. 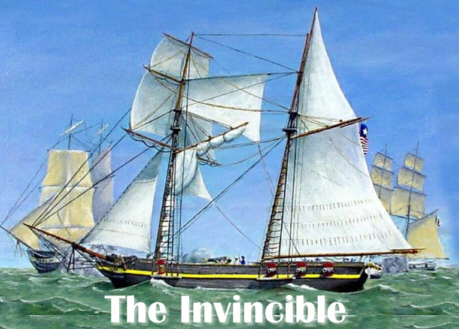 The Invincible, a schooner built originally for the slave trade, was commissioned a few days later and the Independence, a former United States revenue cutter, which had been used to enforce customs regulations and catch smugglers, became the third purchase. Finally, the Brutus completed the Texas naval fleet. Immediately, the little band of ships sailing the Gulf of Mexico kept General Santa Anna’s army from receiving supplies, forcing it to forage for food as it marched across Texas. The ships also captured Mexican fishing vessels, sending their supplies to the volunteer Texas army. After Texas won independence from Mexico in the Battle of San Jacinto on April 21st, the Liberty escorted the ship carrying the injured General Sam Houston for medical treatment in New Orleans. That’s when the navy experienced its first setback—the Liberty remained in New Orleans for repairs and when the new Republic of Texas could not pay its bill, the Liberty was sold. Similarly, the following September the Brutus and the Invincible were in New York for repairs and when the city’s customs collector realized the Republic of Texas could not pay the bill, the gentleman paid the tab himself. Meantime, Mexico refused to ratify the treaty that General Santa Anna signed after his army’s defeat at San Jacinto and despite not having the military strength to launch a full attack on Texas, Mexico continued to make threatening forays along the coast. The schooner Independence captured several small ships off the Mexican coast and after undergoing repairs in New Orleans in April 1837, started back to Galveston when it was forced to surrender after a four-hour gun battle with two Mexican ships. With the loss of half its fleet, the secretary of the Texas navy and its commodore decided that the men needed a cruise to inspire confidence. President Houston believed Texas needed the ships to patrol the coast, not go on a cruise raiding Mexican towns. Nevertheless, the cruise took place and when the Invincible returned to Galveston it drew such a deep draft that it could not cross the bar into the harbor. As it sat at anchor waiting for high tide to allow it to proceed, two Mexican ships attacked. The Brutus, which has managed to enter the harbor, sailed out to help in the fight and ran aground on a sandbar. After a daylong battle, the Invincible attempted to enter the harbor, went aground and was destroyed. The Brutus, last of the ships of the Texas Navy, was lost the following October in a storm at sea. which gave Texas time to purchase six ships at a cost of $280,000. 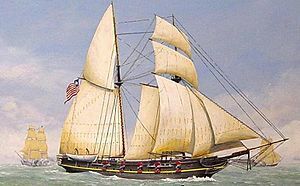 In March 1839 a steam packet was purchased and renamed the Zavala, the first ship in the second Texas Navy, followed by the San Jacinto, the San Antonio, the San Bernard, the brig Wharton, the sloop-of-war Austin, and the Archer completed the second fleet. Political differences existed from the beginning of the republic between President Houston and Vice President Mirabeau B. Lamar and came dramatically to the surface in December 1838 when Lamar became the second president of the Republic of Texas. Whereas Sam Houston wanted Texas to use its ships to protect the coast and insure the republic’s increased industry and commerce, Mirabeau B. Lamar encouraged the navy to pursue an aggressive policy of raids to keep Mexico busy defending its coastline. During Lamar’s three years as president he initiated a friendly relationship with the Yucatán that had declared itself independent from Mexico. In December 1841, just as Sam Houston was returning for a second term as president, Lamar sent the Austin, San Bernard, and the San Antonio to the Yucatán for defense against Mexico. Immediately after Houston’s inauguration, he ordered the fleet to return. In the meantime, the only mutiny in the Texas Navy occurred in New Orleans on February 11, 1842. The schooner San Antonio was in port to be refitted. Apparently concerned the sailors and marines would desert, the officers confined the men to the ship and went ashore. The men got drunk on liquor that was smuggled aboard and Sergeant Seymour Oswalt led a mutiny in which a lieutenant was killed. Eventually the men were brought to trial; three were flogged; four were hanged from the yardarm of the Austin; and Oswalt escaped from jail. Mirabeau Lamar had appointed Edwin Ward Moore, a ten-year veteran of the United States Navy, commodore of the second Texas Navy and Moore was as determined to defend the Yucatán as Lamar. Moore had constant problems financing the repair of his ships and because paydays did not come regularly, he had trouble recruiting enough men. The Zavala had been allowed to rot and was eventually sold for scrap. Houston, determined to reduce spending in his second term, withheld funds allocated by Congress for the navy. Moore raised almost $35,000 to repair his ships and when it became clear he could not raise enough money in New Orleans to refit the ships, Houston ordered him back to Galveston. 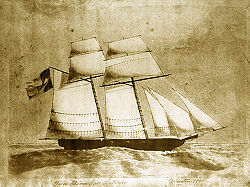 Hearing of renewed Mexican troubles on the Yucatán, Moore arranged to supply Texas ships to Yucatán for $8,000 a month. He sent the San Antonio to the Yucatán but it was lost at sea. Just when the Austin and the Wharton were ready to sail from New Orleans, commissioners arrived with orders from Houston instructing Moore to sell the fleet immediately for whatever price he could get. Further, Houston suspended Moore from command and told him to return immediately to Texas. Moore convinced the commissioners to allow him to take the vessels back to Texas and as he embarked on the trip, he got word that Yucatán was about to surrender to Santa Anna. Commodore Moore headed for the Yucatán. The resulting battles against the much larger Mexican vessels did not produce a victory, but it broke the blockade of Campeche and allowed Texas ships to get supplies to the forces fighting the Yucatán land battle. After a week the Mexican force sailed away, Yucatán was not retaken, and Moore believed Texas was spared the invasion that would have followed if Mexico had captured the Yucatán. A very angry President Sam Houston claimed Moore’s cruise was illegal and charged him as a pirate, a murderer, a mutineer and an embezzler. When Moore reached Galveston on July 14, 1843, he was welcomed by a harbor full of boats loaded with cheering people. Houston discharged Moore dishonorably from the Texas Navy for disobedience of orders, fraud, piracy, desertion, and murder. Moore insisted on a court martial and was acquitted of all the charges except disobedience. The following year he was cleared of disobedience. The political battles had not ended. Texas had attracted volunteers to fight in its War for Independence by passing a bounty act on November 24, 1835, promising 640 acres for two years of military service. Veterans of the Texas Navy did not get a single acre of almost ten million acres that were distributed as bounties. President Sam Houston vetoed a resolution on January 6, 1842, that would have allowed navy veterans to receive a bounty claiming they were an “unnecessary extravagance.” He added, “Generally, the seaman has no interest (except a transitory one) on shore.” An effort to reintroduce the bill and pass it over Houston’s veto met no success. The Texas Navy had come to an end. The Republic of Texas was negotiating with the United States to join the Union. As part of annexation, the Austin, Wharton, Archer, and San Bernard became part of the United States fleet. Their officers hoped to be included in the transfer, but US naval officers were against the plan and the Texas ships were declared unfit for service.